The Reader – a new approach to my photography perhaps? Following my one day workshop with Andy Beel in Bath recently, I have started to observe and then process my images differently. I would like to think that I am trying to approach my photography is a more artistic way. This ‘new’ style is also a result of my acquiring a Leica M Monochrom earlier this year, which when coupled with the 50mm f1.4 Summilux lens provides me with plenty of creative opportunities. The files it produces are quite superb and allow plenty of latitude in post processing. I have yet to fully appreciate all of its capabilities but the learning curve is a very good one! For a start, the one camera and one prime lens approach also means that I spend more time looking and taking pictures instead of zooming in and out, or swapping lenses. The fully manual controls also help to ensure I am thinking about the look I am trying to create. I haven’t perfected it yet, but manually focusing is getting much easier and more intuiative. The shot featured in this entry was taken yesterday in the fishing village of West Bay in Dorset. 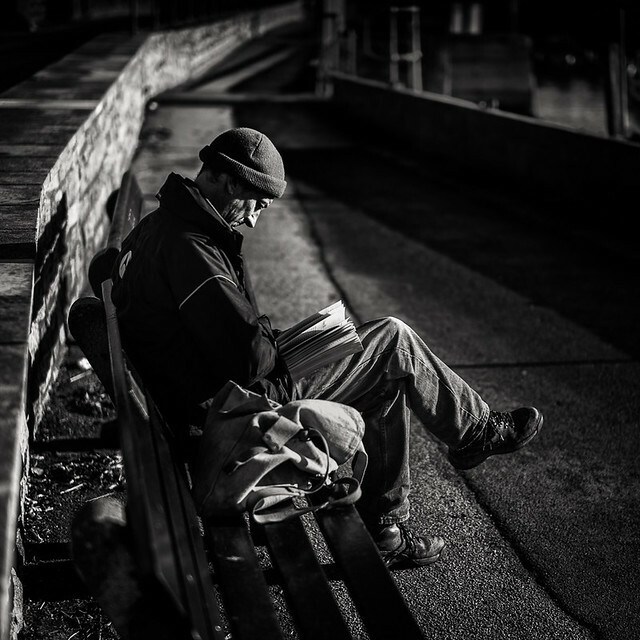 I was attracted to the way the light fell on the man’s face and clothing as he sat in the winter sun by the harbour side, absorbed in the pages of his book. I guess he probably works in the fishing industry but found himself with time on his side. I have increased the contrast and darkened areas of the picture, so the eye is drawn to his profile which is sharp in comparison to the out of focus background. I also like the way the light is falling on the harbour wall as it disappears into the distance. I have added a ‘copper tone’ at 20% in Silver Efex which I think suits this image. Thanks to everyone who has started following my blog recently. Oh what a tangled web we weave…..
A very nice image. I like the composition; how all the angles, the curb, the crossed leg and the wall behind all force the eyes to the subject. Well done. I don’t know what your old style was like,but I like this. Thanks for your kind comment Steven. I am not sure if my style has changed necessarily, I was just more conscious on this occasion of the light and how I visualised the processing when I took the shot. Thanks Andy. I was pleased with the result and like you say there is more to the image that just the man reading his book. Hopefully there will be one or two more to post from our visit to West Bay. That’s a great composition – the way the wall and the path curve round the man and into the distance. I had the privilege of shooting with the new Leica M at the Academie this past summer during the course of one of their workshops. I posted about it, if you’re interested: http://lensscaper.wordpress.com/2014/09/13/a-leica-an-exhibition-and-a-walk/ The switch back to manual focus was quite a challenge. And the price made the eyes water. That’s likely to be the only time I will shoot with a Leica. Our workshop was also run by Robin! Well written up. A superb gallery of images too, Alan. One thing puzzles me: with the Monochrom do you have the facility to ‘filter’ the colour image? When I shot on B&W film for 20yrs, an orange filter was almost always screwed on the lens to get contrast in the sky. And when I convert to B&W in Photoshop I nearly always use the option that allows me to adjust how the individual colours will be rendered on the grey tonal range. Do you have any control over the way the camera interprets colours? To answer your question there are no colour channels as the sensor only records luminance, so it behaves just like black and white film. I have even taken to buying a couple of colour filters, which seems a rather alien thing to do for a digital camera. It is truly a niche piece of equipment but I am loving very minute of it.